The VMU uploader is down at the moment. You can still download VMU saves, only sending VMU files is temporarilly unavailable. The bug will be quickly fixed, thanks to Patrick for having reported this. While browsing YouTube, I found some particullary interesting videos showing Dream Explorer / VMU Tool in action. 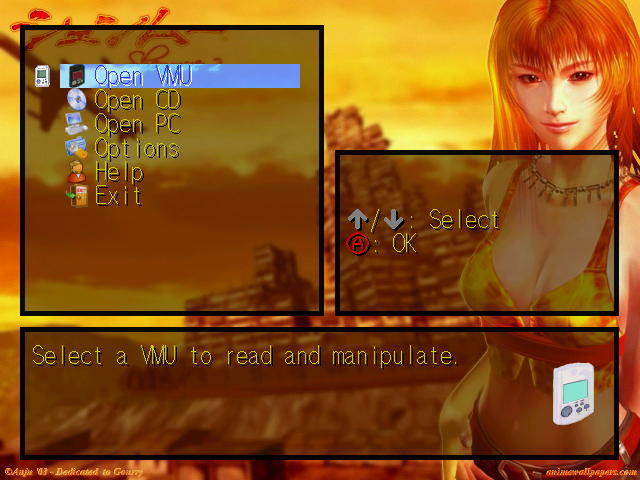 The first one explains how to enable the VMU hack to display the Dreamcast BIOS menu in 3d, and how to change Dreamcast background image. The second one is a demo of the 3d Dreamcast BIOS menu with the VMU hack enabled, the quality is better than the first one. Don't hesitate to share your Dream Explorer's videos as well. It's always a pleasure for me to see that my work is useful and appreciated. Videos have been added into the Dream Explorer > resources > videos section. You need a recent version of Flash Player to watch these videos, so you can't watch them with Dreamcast browsers DreamKey, DreamPassport and Planetweb. VMU Shell is a Windows shell extension that allows you to display info of VMU files from your hard drive disk in Windows explorer's interface. When you hover VMI and VMU files (as well as DCI and DCM files later) with your mouse, a dynamic tooltip containing your files most important info is displayed, so you don't need to open them in a particular tool anymore. 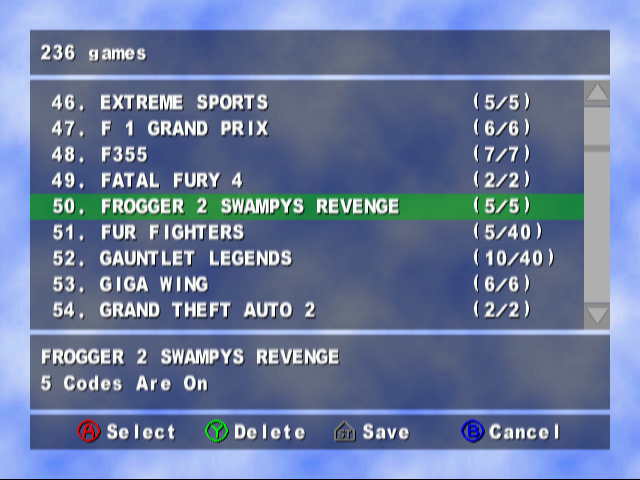 Also icons associated with files are replaced with dynamic icons corresponding to icons displayed in Dreamcast BIOS. VMU Shell should also add some features to the contextual menu as well as a panel in the "Properties" menu to edit your files very easily. A first version should be available soon. On Rolly's request, a new online tool is available. TXR2 Stickers Editor is a tool for the Dreamcast game Tokyo Xtreme Racer 2. It allows to use images of your choice as custom stickers to decorate your cars. This tool is still in early stage of development and might have some bugs, please let me know if you find one. The VMU saves list has been slightly updated. 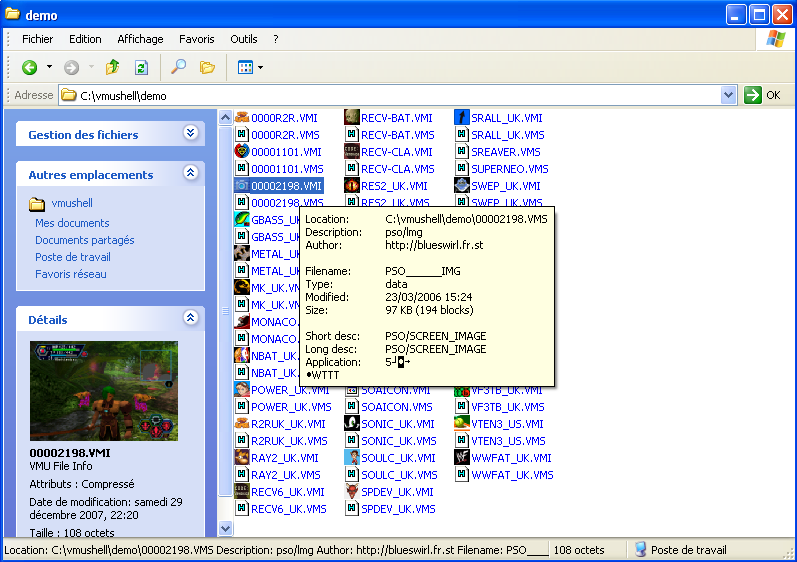 Thumbnails are now available for saves containing images, as well as for PSO snapshots saves. Merry Christmas and happy holidays everyone ! Rolly from Sega Support, a new partner site of Blue Swirl, has sent numerous VMU saves as well as some exclusive VMU mini games. Go download them in the VMU saves' list, the minigames will be soon copied to the VMU games section. Thanks again to Rolly, don't hesitate to visit his site (in polsky). the VMU games section has been remade from scratch. This section now contains more than 100 VMU minigames ! More VMU games will be added soon. Comments and ratings will be gradually supplemented. Extra BG Maker, the online tool which allows to hack Dreamcast boot menu's background image, underwent a big update. several changes have been made lately. the site is undergoing a quite important update. This update especially concerns the VMU saves section. If you encounter problems connected to these changes don't hesitate to contact me as soon as possible to let me know. DreamcastJunkyard has made a video showing Dream Explorer's VMU emulator running. For recall, the VMU emulator SoftVMS was originally made by Marcus Comstedt, I then ported it to the Dreamcast thanks to KalistiOS and included it into Dream Explorer. This video is really well done and perfectly shows the great number of available VMU games. I also advise you to watch DreamcastJunkyard's other videos that are as much interesting. You can watch this video at Dailymotion or at YouTube. You'll need a recent version of Flash Player, so you can't watch it with Dreamcast browsers. A bug in the VMU saves list's search engine has been fixed. Also it is now possible to see suggested results in real time while typing thanks to a newly implemented AJAX function. Also the trial version of Disc Juggler you could download in the downloadable tools section has been replaced with Disc Juggler 3.50.830 trial. After checking, previous version didn't allow you to burn Dream Explorer's selfboot image correctly. Sorry for the inconvenient, thanks to Damien for reporting this problem. As you probably know, Phantasy Star Online's official Dreamcast servers will shut down in a few months. These servers offer some unique quests that become playable offline once downloaded. Sadly, these quests won't be available anymore as soon as servers shut down. That's why a visitor thought about adding a new directory to the VMU saves list especially made for PSO downloadable quests. Connect to official servers while they're still online and download the quests, then upload them to the site. This way you'll be able to download them at any time after the servers shut down from the PSO quests page. 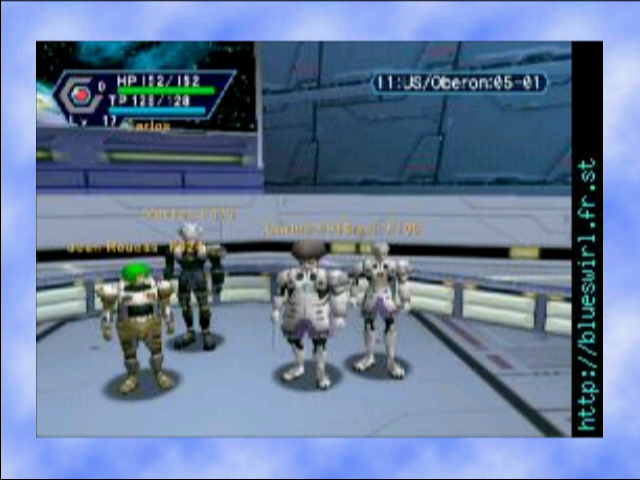 You can upload PSO quests with PC/Mac browsers or the Dreamcast browser Planetweb. To be able to upload PSO quests with DreamKey/DreamPassport you first need to disable copy protect thanks to Dream Explorer (Open VMU > File manager > Allow copy). Quests are unique and can't be shared by players, that's why quests uploaded can only be used by their owners. Don't forget to put your name in the description to find your quest easily later. The site was not accessible for almost a month due to a problem with the host. All the content has been backed up just before the incident, so there shouldn't be any loss. I'm sorry for the inconvenience, and I thank David Maher for sorting this and still hosting Blue Swirl at KitsuNet. In the future please visit Blue Swirl from http://blueswirl.shorturl.com to be aware of potential problems. Note that I'll probably be very busy soon and I might not be able to update the site and my projects as oftens as before for some time. 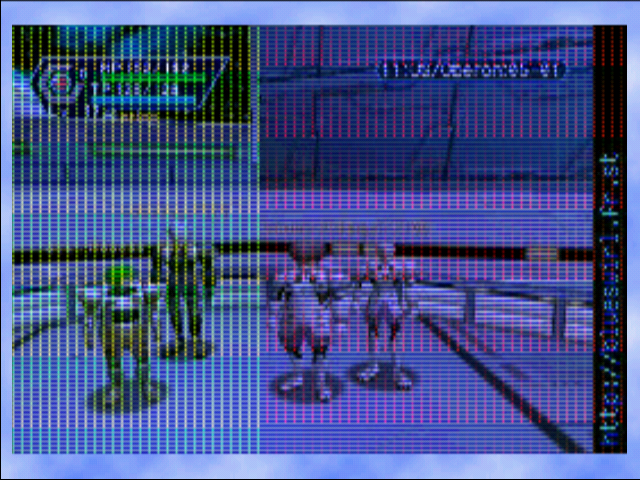 Please keep uploading your VMU savegames and PSO Snapshots frequently to keep the place updated. 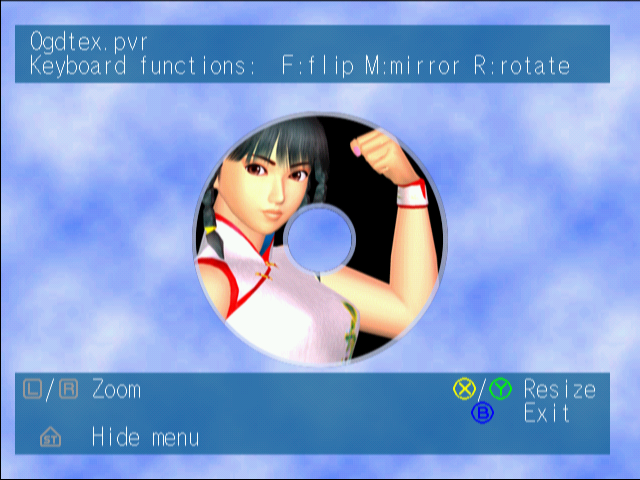 PSOSSD is an online tool that allows you to convert Dreamcast PSO snapshots (PSO______IMG VMU files) into PNG or JPEG images, and to edit them. It seems that this tool was unusable for some time, but nobody contacted me about this, until yesterday. Thanks to Kolibry who reported the problem, an important bug was fixed and the tool is fully working again. The VMU uploader (compatible with PC/Mac/DC), which allows you to upload the Dreamcast save games from your VMU to the VMU saves section, has just been updated. The changes have been tested, but if you encounter problems please report them as soon as possible. Please submit all your Dreamcast VMU saves for the upcoming release of the new version of Dream Explorer. Only a few days to go to have your VMU files added to the selfboot CD. Thanks for your contribution. No idea? Well it's a project I had in mind for a long time, it's still in very early stage of development but it's fully working. The site is now having a big update, which could make some pages temporarily unavailable or broken. Please report any problem. Updates so far: page display, navigation menu, main/news page, banner, online tools, downloadable tools and VMU saves. Next in the list: VMU uploader and VMU games. 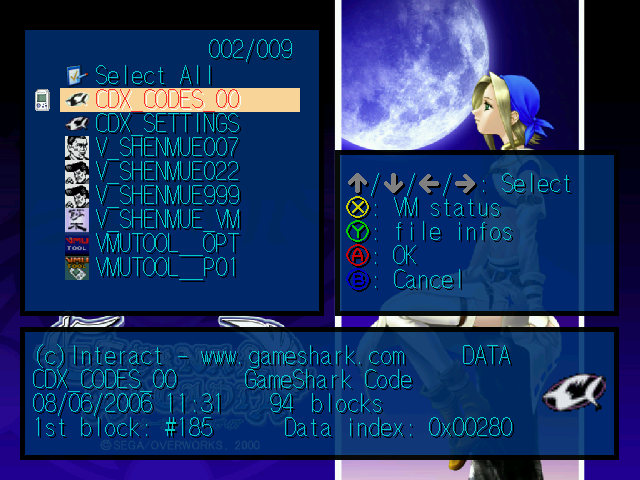 Dreamcast browsers' users may notice that the page display without frames is now larger than the screen's resolution. But once you scroll to the right it should fit into the screen perfectly. A bug with the new experimental online tool SoA Saves Editor has been fixed. 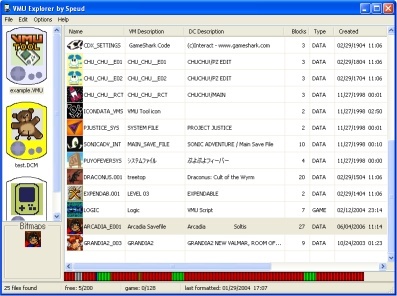 It prevented Dreamcast users to upload their files because of a problem with the name detection. BmpToVmu is a command line tool that allows to create a VMU icon or eyecatch from a BMP image. You'll then be able to insert converted bitmaps in a VMU file, which is particularly useful for your games/emulators/apps projects for Dreamcast. This version should be available soon, although no date is known for now. My old motherboard died, forcing me to buy a new one. The new motherboard wasn't compatible with other components, so I finally had to replace most of the hardware. Luckily, all datas are safe, but my dev environment as well as most programs must be reinstalled. Obviously such an expense wans't planned and isn't welcome, that's why more than ever your donations are greatly appreciated. Thank you. 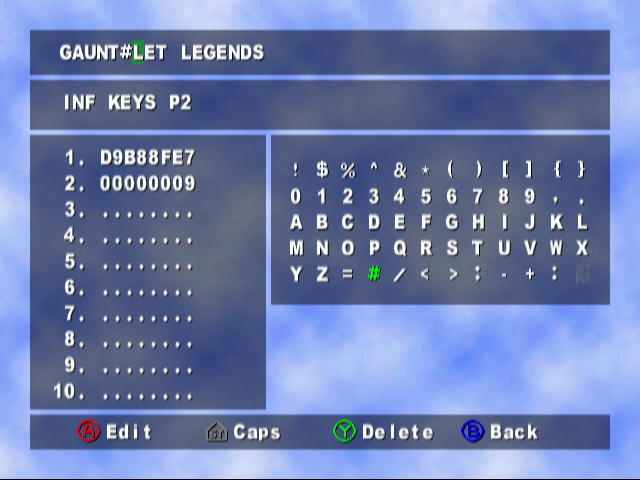 Shortly before my PC crashed, Jules le Noob from DC-Reload's forum very generously sent me his Skillz memory card. This memory card for Dreamcast is a Nexus memory card's clone and theorically allows to transfer your saves by connecting it to a PC. But the software DC linker supposed to transfer the files doesn't seem to fit to Skillz memory cards. Also the current version of Dream Explorer doesn't fit to them neither. Thanks to Jules' contribution, I could identify the problem in Dream Explorer and fix it mostly, so the next version will support Skillz memory cards and maybe other Nexus cards' clones. I also think about implementing transfer functions similar to DC Linker's in the Windows utility VMU Explorer. 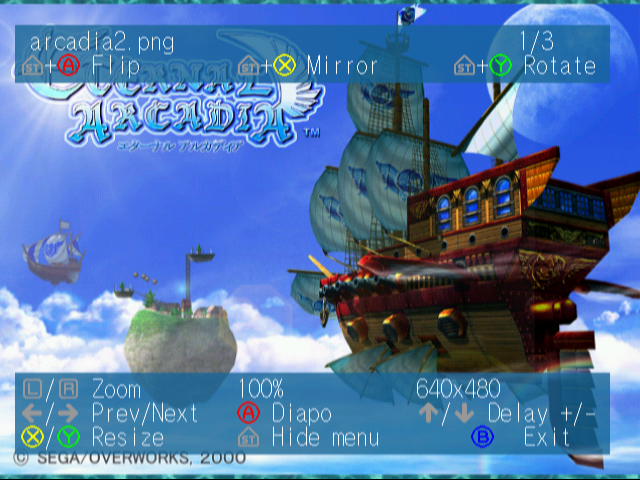 SoA Saves Editor is a tool to inspect the content of the saves for the Dreamcast game Skies of Arcadia. For now it only allows to display stats of each character as well as the game time and the save location. Later stats might be editable, so you could for example increase the level or health points. The tool is compatible with DC browsers (DreamKey, DreamPassport and Planetweb), as well as PC browsers (in this case you must use saves in VMS format). A bug freezing the VMU selection menu has been reported. If you are stuck after having chosen the "open VMU" menu try to choose another language such as english in country options. It looks like this bug only concerns this menu and the german language. Thanks to Christoph and Christian for reporting this bug. In addition, the background music may crash the program sometimes. If you often notice this problem try to disable the background music in sound options. 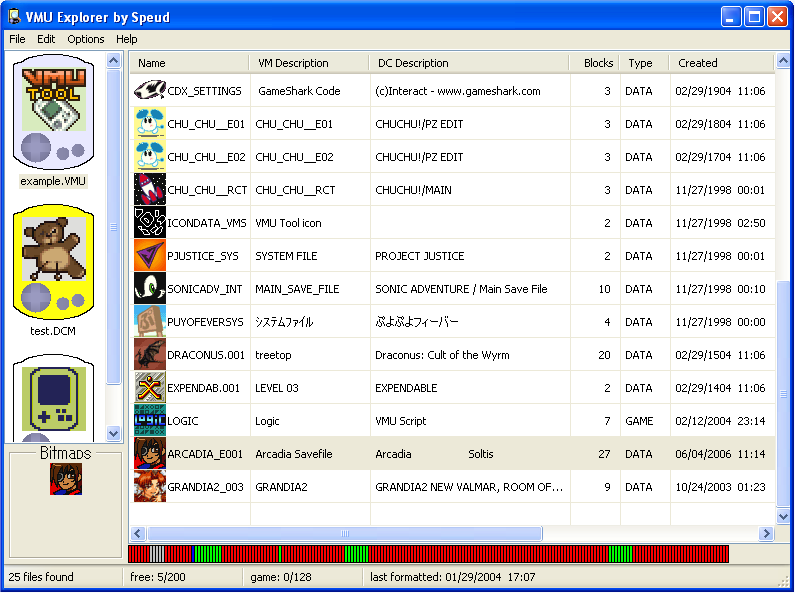 New PC tool: VMU Explorer. 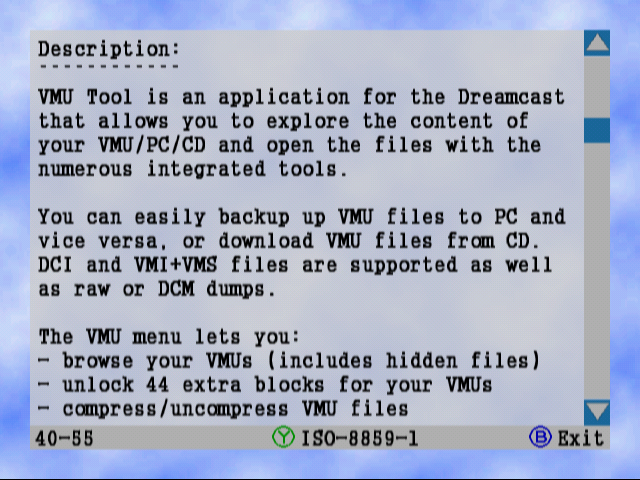 This program allows you to open VMU dumps made with VMU Tool - Dream Explorer (.VMU, .DCM) or Chankast (VMS.BIN). It supports raw VMU dumps as well as Nexus cards dumps. 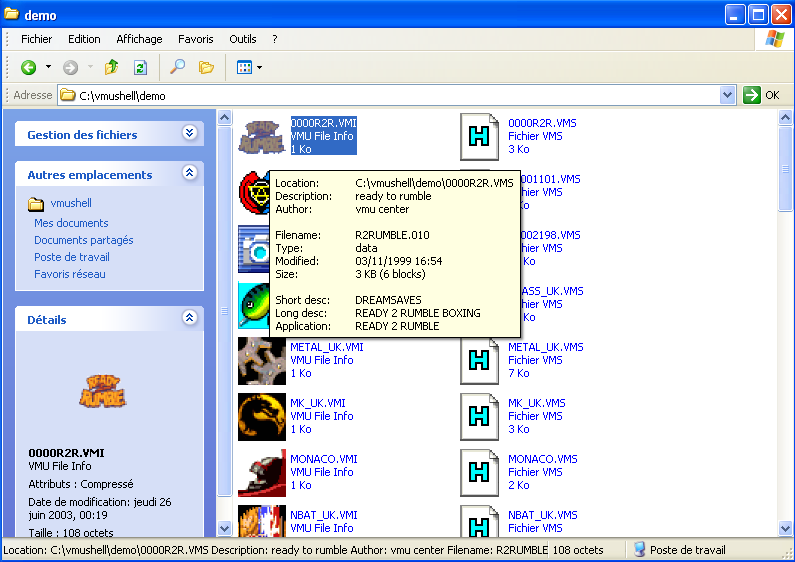 The files list displays all info and bitmaps, all filetypes are supported (icons, games, saves). Eyecatches and (animated) icons are displayed correctly. Description of each colon can be read by clicking the header. You can see position of blocks used in the VMU for each file. The VMUs are fully scanned and all the files found are displayed. The only limit of the files list is the size of the VMU. To avoid modifying your VMUs by accident, changes won't be saved to the VMUs unless you select the save option. 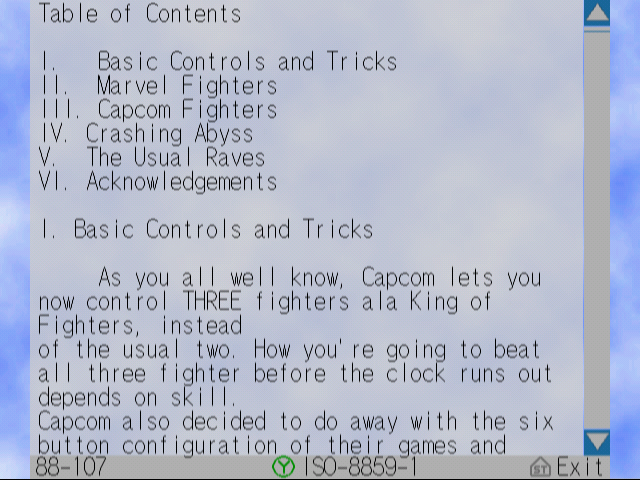 The archive includes descriptions of how to use it with Chankast and your real VMUs in the readme file, also includes an example VMU dump containing various saves for several Dreamcast games. Kurdy from Dream Storming has contributed with a nice sticker for the CD of VMU Tool - Dream Explorer. Download the PSD file for Photoshop here. 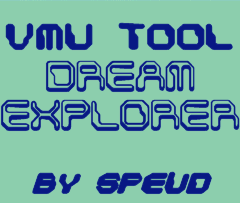 VMU Tool - Dream Explorer 0.8.5 has just been released! 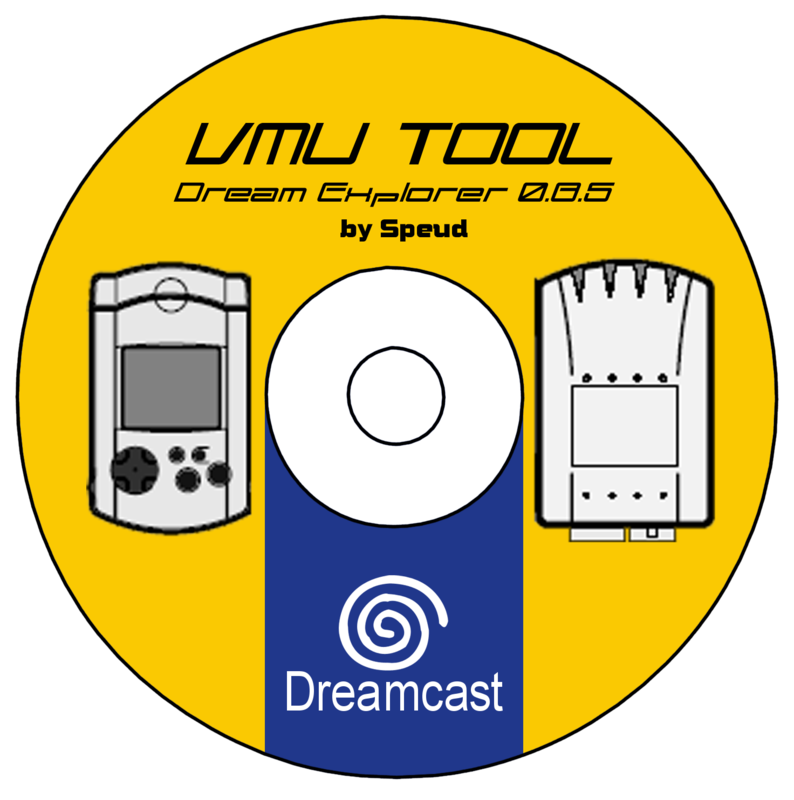 VMU Tool - Dream Explorer is an application for the Dreamcast that allows you to explore the content of your VMU, PC, and CD/GD, and open their files in the numerous bundled tools. Read the full description on this page. New version fixes many bugs, improves menus graphics and implements new features. The list of changes from version 0.8.0 can be found on this page. The CD image includes almost 6000 VMU saves, 400 Shenmue VMU Goodies, 130 VMU games, 350 VMU icons, 32 new wallpapers and 9 new musics. 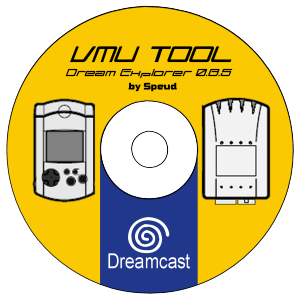 Download VMU Tool - Dream Explorer 0.8.5 in the format of your choice on the downloads page. Sorry for this downtime, the server's owner had some hosting problems, but thanks to him it's solved now and Blue Swirl can be hosted again with all its previous content. Make sure you always link/visit the site from http://blueswirl.shorturl.com. I used this server's downtime to improve VMU Tool, the most important improvement is the cheats editor. 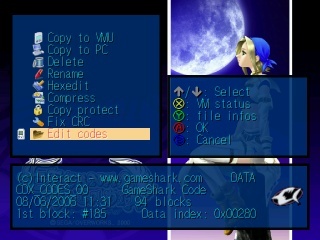 That's a tool I added that allows you to open Gameshark/Action Replay CDX saves from the VMU or the PC/CD, it lets you browse list of games/codes and edit them. It works just like Gameshark CDX does, except the interface is faster and handier. You can view the position of a game/cheat in the list more easily thanks to scroll bars and enter text with keyboard or pad. Plus you can insert and delete chars. I also added the ability to replace font used in tools, the font of your choice will be used instead of the thin bios font that was not so pretty and hard to read sometimes. SiZiOUS and I collaborated to make a PC app to browse VMU files of a directory. 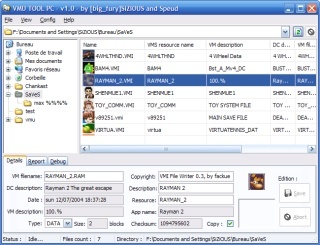 The explorer works like Windows', you can freely browse the directories of your PC, VMI+VMS and DCI files found are displayed in a list with VMU icons and main info. You can also read more about the selected file in a frame displayed under the list and edit fields. It's very useful to browse the files you backed up with VMU Tool Dreamcast, since Windows Explorer is unable to display icons or file info. You can download SiZiOUS' release with his great GUI here, or just the command line app made by me there. Feel free to use the command line program in your apps as long as you release the program without alteration with your project and you credit me for it. DESPITE OF WHAT YOU CAN READ HERE AND THERE, VMU TOOL 0.8.5 HAS NOT BEEN RELEASED YET! I appologize to those who downloaded and burnt version 0.8.0 again. the new version was almost ready to be released when I discovered another bug from the previous version. So I decided to take some more time to fix this bug, this shouldn't take too long hopefully. The theme only sets default wallpaper and colors, you're free to change them anytime as you wish. The new version of VMU Tool which fixes some bugs and adds new exclusive features will be slightly delayed. It should be released before saturday and will include more than 5000 VMU saves! It should have been released at the begining of this week, the reason of the delay is I didn't get all the files yet. I have most of them but I didn't receive those from one site yet so I wait for its webmaster. The VMU uploader for Dreamcast and PC had a bug that has been fixed lately. The list of games that should have loaded after opening the page failed because of PayPal donation's button added a few days ago. You can add your VMU saves again to the VMU saves section. VMU saves sent before saturday will be included in VMU Tool 0.8.5. 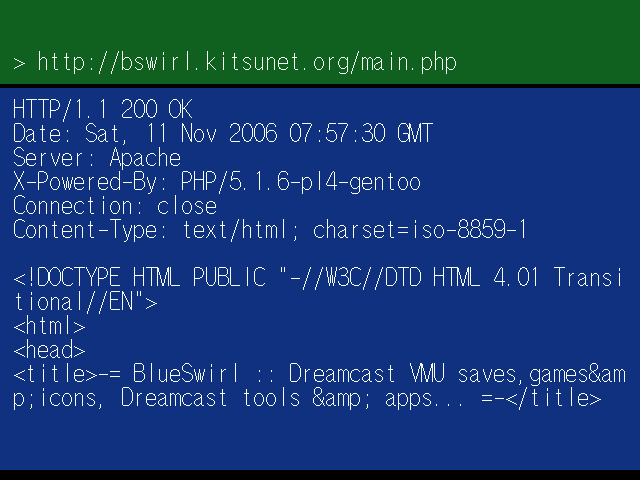 I contacted Ken Soohoo president of Planetweb inc. and he gave his permission to include VMU files from http://dreamcast.planetweb.com into VMU Tool's selfboot image ! Another bug fixed in VMU Tool v0.8.0. You may have noticed that in VMU Tool 0.8.0 some images/thumbnails didn't appear correctly. This bug has just been fixed and will be removed from the new version that should be released next week. The VMU Saves section has been updated. 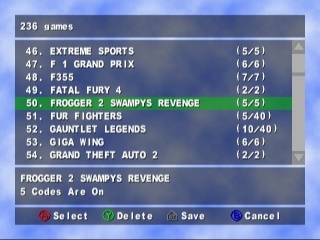 It now displays number of saves and date of last upload for each game of the list. The list can be sorted by name or by date, which makes it easy to find most recent saves. 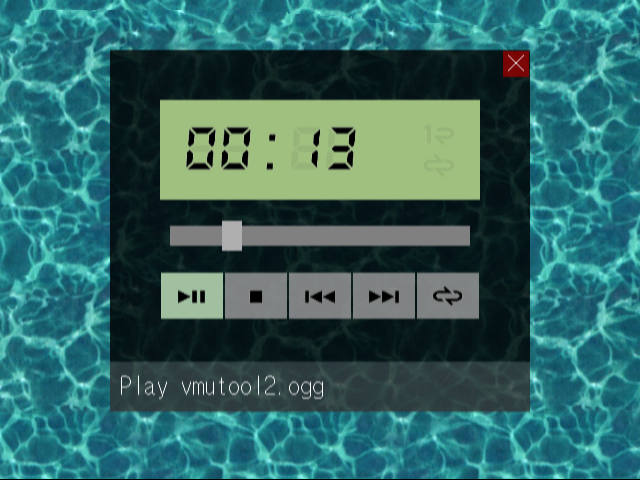 Only a few days before the release of the new version of VMU Tool. 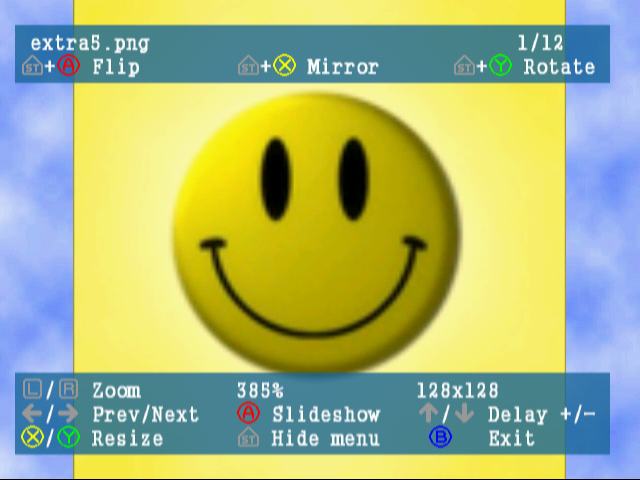 Hurry and upload your VMU saves if you want them to be added in the selfboot image! bugs in VMU Tool v0.8.0 previously mentionned have been totally fixed. Some new features and improvements have appeared as well. You can now browse not only the content of your CDs, but also original GDs! 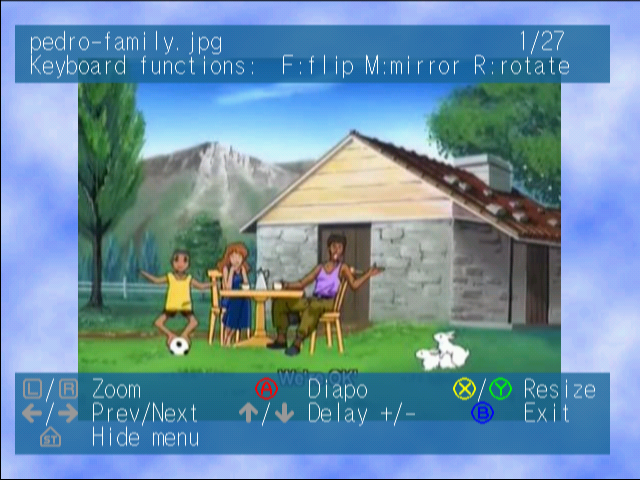 You can freely browse your original games and display images and PVR textures with the image's viewer, or read text files. 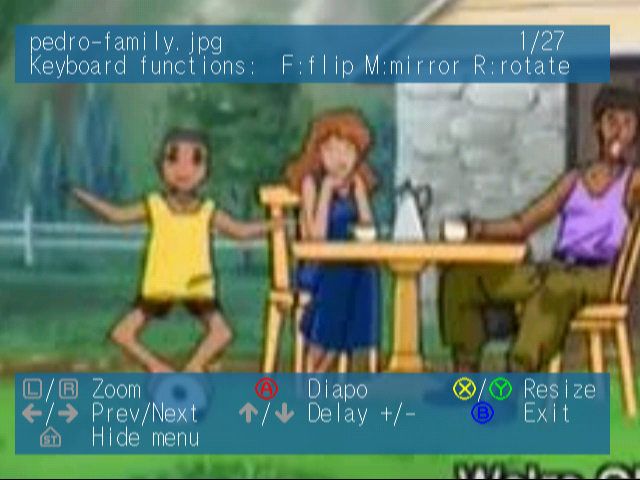 Also BMP images are now readable as well. The new version should be released before next week hopefully. VMU Tool v0.8.0 bugs found. a VMU formatted a sunday creates a buffer overflow and crashes the app. You can avoid this bug for VMU dump's file info by not displaying file info with Y, press X instead. Thanks to Michael for reporting this bug. 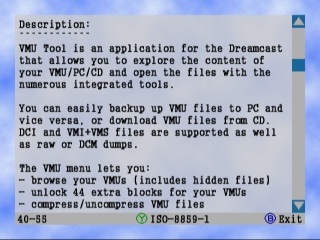 the file can't be compressed unless you connected your Dreamcast to your PC with a coder's cable or a BBA, and you made a directory named "vmutool" at the root of your hard drive. This bug happens because I changed the temporary file's path for debugging and forgot to change it again for the release. Thanks to John for reporting this bug. - when you rename a file with the keyboard and it has an extension, if you delete a character the extension becomes editable. 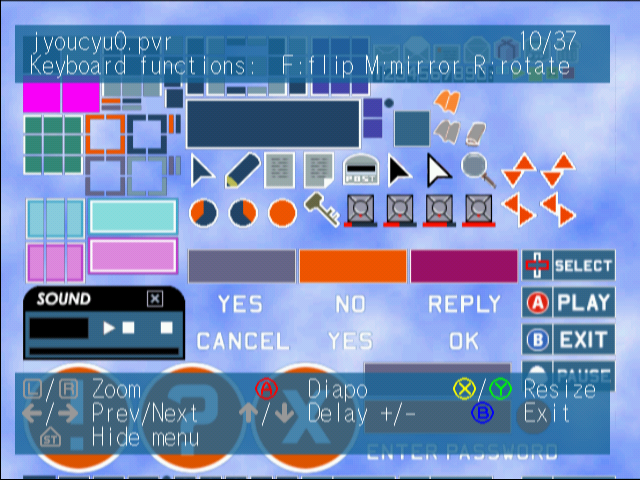 - controls in VMU emulator are confusing, menu says "Sound/Filter Off" when sound/filter is on. That's not a bug, it means press the button to turn sound/filter off, not that sound/filter is already off. Thanks to SunDragon for reporting this problem. These bugs don't cause any damage to your Dreamcast or VMU, they are already fixed or being fixed and will be included in a new version released soon. It should also include some new features and improvements that will be announced for the release. Feel free to upload your saves to the VMU saves section so they can be added for the next release. Thanks for reporting bugs/problems and letting me know of your suggestions/feelings about VMU Tool. VMU Tool v0.8.0 released !! At last, after many delays and headaches, the new version of VMU Tool is ready for a public release. Thanks for your patience, I hope you'll all enjoy it. Oh and yeah, I bought a new Dreamcast, thanks to visitors who offered to help. Developments of projects for the Dreamcast are temporarily suspended, my Dreamcast refusing to read any CD or GD. I'm looking for a Dreamcast or a GD Rom drive unit of replacement for a resonable price, for now my tries on E-bay have failed. If you have a Dreamcast or a GD Rom drive unit that works and/or want to contribute with a gift don't hesitate to contact me. The new version of VMU Tool is ready to be publicly released, sadly I couldn't test last changes, that's why its release will be delayed until I obtain a new Dreamcast or a GD Rom drive unit of replacement. - PSOSSD allows to convert PSO______IMG files (VM files created by PSO when you save a snapshot to your VMU) into PNG or JPEG images, to send them by e-mail or to put them on a website. This tool's update fix some bugs and allows PC browsers as well as US Dreamcast browser Planetweb to send their files to be converted. - VMU Downloader (old name VM Checksum Convertor) allows to download a VMU file from the address of a VMI file or the address of a VMS file in correcting bad checksums that can forbid downloading from some browsers or corrupt a file. This tool's update fix some bugs and now allows to create a VMI file on the fly from a VMS file. While I was developping VMU Tool I've been interested by possibilities offered by the PC<->DC connection that are not yet exploited. DC load+DC Tool allow to transfer files from the PC to the DC and vise versa. The source code of these programs helped me to immagine other applications that could be interesting. At the moment I am exploring the possibility to download a file from the internet on DC thanks to the PC connected to the serial port, by using the PC internet connection and so without the need of any DC isp. I also thought about using the PC<->DC connection to enter keys thanks to the PC keyboard and transmit them to the DC in real time, avoiding then to have to use a DC keyboard. Another possibility might be to transfer files to the PC and reverse even when the DC program hasn't been sent from the PC. most online tools didn't work anymore due to a bug connected to the change of host, permissions change didn't allow new files to be created anymore. If some other problems happens make sure you contact me quickly so they can be fixed. About 10 VMU saves with a bad game name have been deleted. Thanks to chose the name of the game in the list or to enter a new one if necessary. due to the change of host the VMU uploader didn't allow anymore to send VMU saves because of a bug. It has been fixed and you should be able to add your VMU saves to the site again. As you probably noticed the site or some of its sections have been unavailable for a few weeks. Thanks to TheGatesOfBill these problems are now sorted and all the content has been recovered. Nonetheless the change of host implies that the site must be clean of all advertising, so I had to remove all the banners of the old sponsor. Anyways these banners were rarely clicked and the fact I deleted them shouldn't have big impact. Also the VMU saves section has been uploaded again entirely, that's why the sending date of the files doesn't match anymore. Apart from these details everything should work from today or soon. If you encounter problems with a page of the site make sure to delete your temporary files before you try again. If the problem still exists don't hesitate to contact me in giving me all the infos you can about the page and the kind of problem. 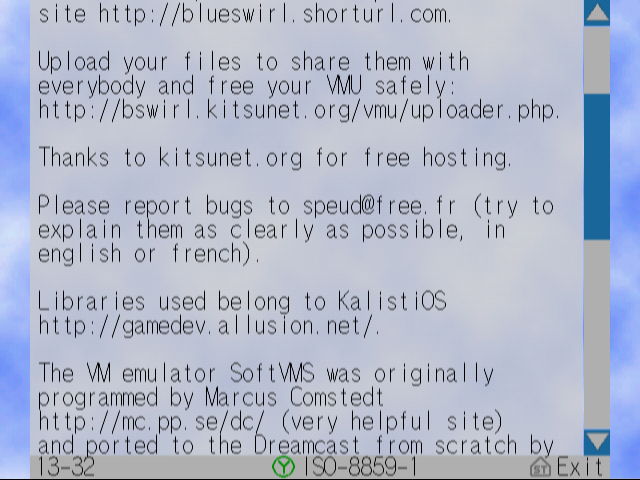 Make sure to always access to the site from the address http://blueswirl.shorturl.com to be alerted of some possible problems connected to the host. Problem when trying to download VMU saves using the link to the VMI file has been fixed and shouldn't return any error anymore. Feel free to contact me to let me know about other eventual problems so they can be fixed as quickly as possible. some visitors mentionned a problem with downloads, it's probably related to the latest updates and will be fixed quickly. Thanks to the ones who mentionned this bug. - The link to the old version of the Extra BG Maker has been replaced by a link to the new version of the tool in the online tools section. - A bug with the online tool VM Notepad has been fixed, the tool now returns the content of the VMS file for PC users as it should have done before. - The online tool VM Quick Save has been updated. The VMS file now contains the correct embedded file size. - The VM library for PHP VMlib has been updated. The main change is the adding of the iconExtractAlpha() function with alpha channel support, this function must be used instead of the iconExtract() function. VMU Tool 0.8.0's release has been slightly delayed. One of the reasons of this late is that I didn't get much help for beta testing, the few people who were interested in beta testing (and I thank them) being busy with other things they sent me their report back after some time and without much details. But the main reason of this delay is my desire to perfect the tool. I decided to add an (quite basic) audio player at the last minute, everything else is ready aprt from a few things to rearrange maybe. So version 0.8.0 so much waited by some of you will be available very soon, although I can't give a release date for now. As announced in the previous news here are some screenies of VMU Tool v0.8.0 that should be publicly available during this month. Click on the thumbnails to see the images in their original size. You'll be able to notice the background image and music selection menu that allows you to freelly choose a file from your PC or your CD ! Also note the interface's improvement with icons in the list as well as in the infos' frame ! The VMU emulator will let you play to your VMU mini games directly on the TV, no batteries nor LCD screen needed ! Some more screenshots will be added for the release. What's up with VMU Tool? People tend to ask me this question quite often. The project is doing well, it's still being developped, and a release might happen this month. Some screenshots will be uploaded soon. Problem with the Extra BG Maker. This online tool has been removed from the server for technical reasons. An improved version is available here until the redirect becomes automatic. Update of the VMU Icons section. This section has been modified to correspond to the site's design. Also downloads are now better recognized by some browsers. Thanks to Vash for reporting the problems. An important bug has been fixed in the VM lib. This bug affected most of the online tools by not creating the necessary VMS icon. This was due to an update of the lib and compatibility problems with older functions. It's very important to report a bug as soon as you discover it. Thanks to hrb for reporting the bug quickly. The site is being massively updated. Those general changes are mainly connected to the design, for framed as well as non framed versions of the site. The main page, the menu, the VMU saves section as well as the public VMU uploader for Dreamcast and PC have already been modified. The VMU minigames section is being modified. The other sections will be modified progressively. During those changes some pages might be unavailable temporarily, in that case please visit them again later and contact me if the problems last. Thanks to everybody who keep updating the site by uploading their game saves. IMPORTANT ! Redirection changed ! 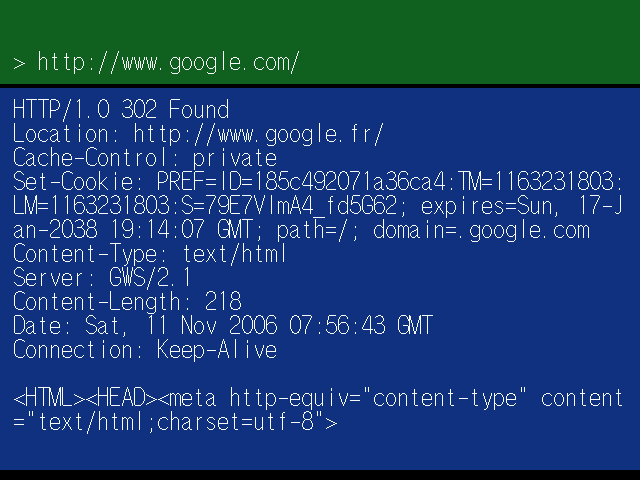 Ulimit's redirection http://blueswirl.fr.st includes new ads requiring the use of a browser supporting iframes. Since DreamKey, DreamPassport et PlanetWeb browsers don't support them it's impossible to display the 1st page of this site correctly by using this address. A new redirection's address has been created and must be used instead of the older one. 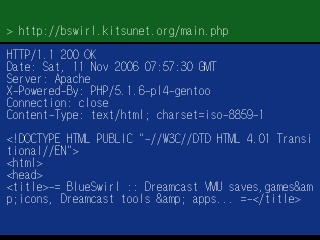 You can now access to Blue Swirl by typing the address http://blueswirl.shorturl.com, thanks for updating your links and bookmarks. As you may have noticed, Lik-Sang's contest didn't start yet, unlike what has been announced in the previous update. I'm a bit too busy at the moment to set everything up but everything will be ready as soon as possible, sorry. Until then, you can still vote for your favorite game thanks to the second poll. The poll to find the kind of contest ended, thanks for voting. The final choice is the gaming contest that won by 2 votes. A second poll starts to allow you to decide of the game for which you will send your hi-score. It will end around wednesday and the contest might start next week end. A free competition is being prepared and will make you win prizes ! A poll has been created to allow you to give your opinion (only one vote by visitor). The TOOLS > PC > VMU Tool section has been updated. Ready to burn images for Disc Juggler and Nero 5 are online now. The page has been translated in french and a link to Sizious' guide has been added. A new online tool for the TOOLS > DC section. VMU Copy as the name says is a tool to copy VM files. This tool is made for DC browsers users only. Lik-Sang.com is from now the official sponsor of Blue Swirl ! For this occasion, we offer you a coupon of $5 to use with your $40+ orders. All you have to do is to enter this code at checkout: LS-AA5255DB579B0B93. This coupon will be available for about 2 months so hurry-up ! As announced in the previous news, the site's display has been slightly modified. The changes are not yet final. The choice of the new banners and announces's position has been made to avoid to disturb the site's browsing, on PC as well as on DC. However, if you really feel annoyed compared to the previous version of the site, feel free to let me know it. A serious bug of the VMU uploader has been fixed. This bug prevented the games' names to be displayed correctly in the list. A big thanks to Andrew B. for having reported this bug. Some old dead links have been fixed. The GAMES > PSO and MEDIAS > AUDIO sections are available again. First i want to sorry for the lack of recent updates. A new version of RADQuake, the DC port of Quake's engine, is available on the site from now. In this section (quite empty yet) you'll find some screenshots as well as an archive containing the source code and the DC executables. For more details you can visit this thread. A page containing the important infos, the latest updates as well as the screenshots has been added. To make this site nice for most people some rules have been added to the VMU uploader. These rules have been defined to avoid the kind of saves that were sent lately. Thanks for reading and respecting these rules. Lik-Sang contacted me to sponsor this site, so some changes in the display should happen soon. here are some screenshots of the WIP version of VMU tool. click on the thumbnails to see them in a higher resolution. i had to remove the BG music cause it crashed after each loop, ill try to implement it in the next version, so current release wont have any sound. im finishing implementing new languages, for those wtho didnt read the latest news it will now be available in french, english, german (thanks Mikey1109), dutch (thanks Captain Skyhawk) and portuguese (thanks WaCk0). Le nouvel hébergeur ne supportant pas les sockets ni GD2 les outils PSOSSD et quake3 scanner sont temporairement inacessibles. Un nouvel outil a été ajouté à la section TOOLS>DREAMCAST: l'extra BG maker. Il permet de modifier l'image de fond du menu de démarrage de la DC à partir d'une texture au format PVR ou d'une image aux formats PNG/GIF/JPEG au choix. Le meilleur rapport qualité/taille étant celui d'une image 64x64. Un outil de ma création a été ajouté à la section TOOLS>PC: le VMU Tool. Il s'agit d'un outil tout en 1 qui permet entre autres de gérer les fichiers de son VMU, de télécharger vos sauvegardes et mini-jeux favorits depuis le CD ou votre PC, un hexediteur est intégré pour pouvoir modifier vos fichiers facilement, ainsi que de nombreuses fonctions supplémentaires dont la possibilité d'augmenter la capacité de votre VMU pour qu'il dispose de 241 blocs au lieu de 200. Vous pouvez en apprendre plus, poser vos questions, envoyez vos suggestions ou notifications de bugs sur ce topic (en anglais). All the pages hosted by stormnetwork are once more unavailable. This time it seems that the bandwidth's limit was exceeded and resulted in a (temporary?) suspension of the account. But TheGatesofBill has very kindly offered to host my tools from now, the site didn't move yet but it shouldn't take to long before it does. I want the visitors to excuse me for these disturbances, and also to reassure those of you who posted their saves, nothing was lost, everything was backed up on my hard drive disk. The server corresponding to the address bswirl.stormnetwork.net has been replaced once again. Consequently some documents might have been lost during the moving. Beside some errors due to the uncompatibility of the 2 servers might appear. Thanks for warning me by mail if you notice something. The VMU > Icon section has been totally remade, a lot of icons have been added and the browsing has been simplified to allow you to download and replace your VMU icon very easily. A new tool allows you to scan the european Dreamcast servers of the game Quake 3 Arena thanks to your browser. You can see in real time who is playing, the score/ping of these players, the map, the server's name... exactly like with the european game. Some servers that usually don't appear in the list are available too. - Several new tools have been added: Hail the web based Hotmail&reg; client, ICQ Sender to send messages to ICQ users, DCI Converter to convert the VM Nexus' files and VM Checksum Corrector to download and use some VM files that were not compatible or recognized before. - Big update of the LCD Tool, the new version of this tool now includes the project LCD animator to manage LCD anims. It is now possible to save the anim into GIF format. - Some bugs have been corrected for the Public VM Uploader and a Private VM Tranloader has been added for the more personnal files. - Complete change of the VMU > Game section with plenty of new mini-games for your VM. - The site move! Stormnetwork having been a more stable host than Free lately I decided to move the content hosted by Free to Stormnetwork except audios and videos medias. - Think about visiting the VM saves list that got longer again, don't forget to share your saves. Update of the LCD Tool. This tool allows you to create your VM icons with a Dreamcast or a PC. It now authorizes you to load an icon from a LCD file or an image in GIF, JPEG, PNG or XBM formats. The compatibility with MSIE and Netscape has been improved to be used as well on PC and DC. The interface and a few functions have been also modified. You can now save the icon in VMS, LCD, PNG, JPEG, or XBM formats. - The pages hosted by stormnetwork seem to be available again for everybody, nevertheless if you can't access to one of these pages try to replace www.bswirl.stormnetwork.net by nergal.hostmatix.com/~bswirl in the address, in thinking about contacting me if the problem lasts. - The Bookmark Maker is a new tool that allows you to group your bookmarks in one more compact file, avoiding the waste of space on your VM. - The LCD Animator is a tool in progress that allows to create an animated LCD icon, from several LCD images created with the LCD Tool or from a web address. - Some bugs due to the server change have been corrected for the VM Quick Save and the VM Notepad. - The Public VM Uploader has been modified a bit to improve the inner FTP client, the saves' list has been also mdified to improve the classification. "It can take up to 3 days before DNS updates everywhere, if by Saturday it does not update let me know and I will ask the host to check their DNS setup." If you can't access to stormnetwork's page you can still access to the mirror saves list and the mirror chat (this chat is for people who already made an account). The missing files have been got back and uploaded manually, however some of them could be missing, contact me if you are in this case. The links of this site have been mostly corrected, being only able to modify my site I count on you to update your bookmarks. If you find an unvailable link where the www is missing I would appreciate you contact the one who created the page to let him know about the new address, it also means the links of my site that i could have forgotten. - New version of the LCD Tool: allows you t make and save your VM icons simply with a dreamcast (dreamkey/dreampassport) or a PC (internet explorer). You have to use your keyboard's keys to draw your icon, the commands can be modified according to your preferences. A preview image is also created in xbm format. - New tool: Quicksave allows you to save any file on your VM (as far as this file's type is recognized by your browser), all you have to do is type the file's URL, you can precise a filetype if you want or let the tool decide for you (advised). In a few seconds you will have this file saved on your VM and loadable from the filemanager. 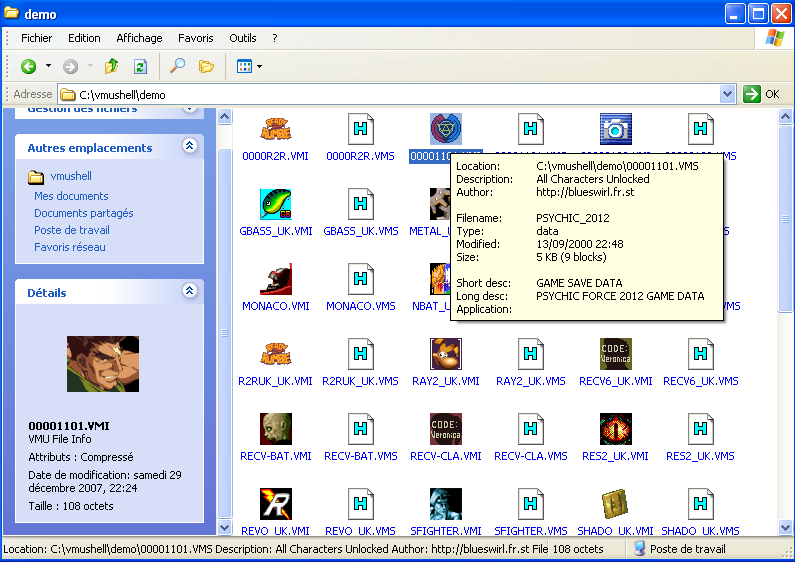 - GAMES > PSO section: a new directory groups the local files contained in the game, if you visit this section with the browser in PSO v2 you will be able to load all the musics and videos of the game (once the page is loaded you can disconnect and load the files offline). - MEDIAS > VIDEOS section: samples of video games have been added. - MEDIAS > AUDIOS section: adding of musics from some Saturn console's games. A new bug with the VM uploader has been fixed. All the saves have been tested and fixed when necessary. A bug with the VM Uploader has been fixed (if you didn't sucess uploading a file recently because of this bug send me the gamename and the description by email so i can complete the list). Some changing on the VMS Hexeditor and the VM Notepad have been done. A new tool is in progress, it will allow you to modify the infos returned by the browser to bypass the restrictions of some sites (such as the official sites of the dreamcast games). A new version of the uploader is available. It has the advantage to work with the 200 blocks max saves. 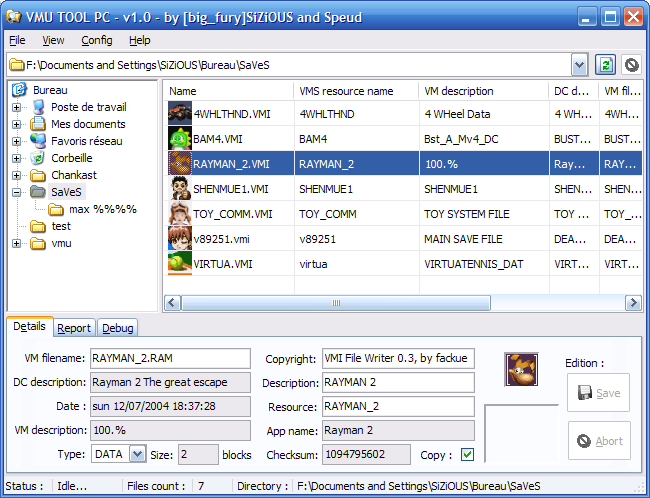 The files contained in the saves such as images or sounds are automatically extracted and viewable from the saves list. A progress bar now indicates approximatively the advancing state of the uploading (usefull for big saves). The saves list has been improved too. The servers of FREE (my host) were suffering of technical problems, you surely had nticed the slowness to display some pages lately. Those problems have been fixed according to their technical support. FREE and myself are sorry for the discomfort those bugs could have create. The MEDIAS > VIDEOS section has been updated. The Animes 80 category has been completed with the M to Z credits, the selection is now clearer thanks to an alphabetical index and a sorting by title. /!\ All the links to the pages hosted by devveb.org wont be valuable anymore from the 6th of may, the host having decided to change to paying service. The pages previously hosted at http://blueswirl.devveb.org will be hosted at http://bswirl.stormnetwork.net. I hope those problems won't prevent you from continuing to visit my site, if you can't access to it at first try please try again later. Answering to some visitors' request the VMNOTEPAD has been modified. You can now save you HTML code (or the one from a page that you type the URL) under the filename corresponding to your browser (DREAMKEY.H** for DreamKey, PASSPORT.H** for DreamPassport). This allows you to load the saved page from the VM filemanager (works offline too). From now you can also load the HTML code from your VM or from an URL to modify it before to save it.